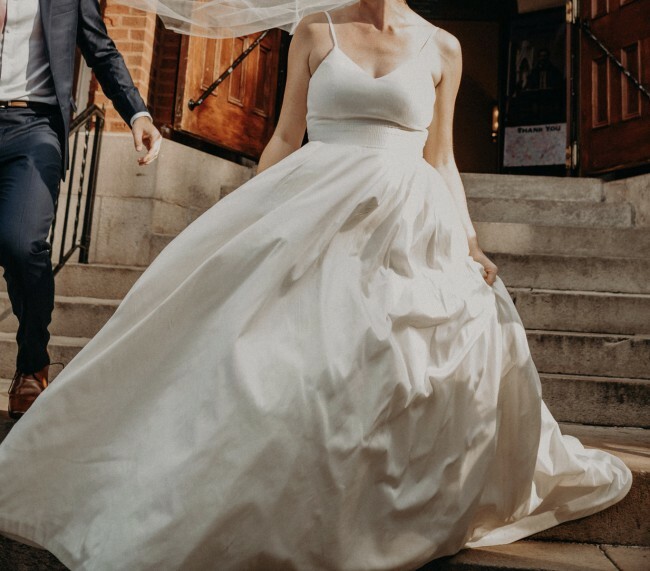 I wore this gorgeous silk skirt very happily on my wedding day. My favorite parts of the skirt are the shape, the button details on the back, the sound the skirt makes when you walk (one of the benefits of a silk skirt), and... the POCKETS, which are handy for storing tissues and other essentials! The only alterations made were the addition of a bustle (see photo #3), which we tied when we got to the reception so that I could walk easily and dance. I left the skirt long during the ceremony and formal portraits, though. Please note that I wore a belt at my waist so you can't see the true top of the skirt in photos #1-#3, but a belt certainly isn't necessary.